More than just audio interfaces, the AudioBox iOne and iTwo are the heart of a creative workflow aimed at taking your inspirations and turning them into finished songs. Tightly integrating award-winning hardware with powerful software across working environments, watch recording artist The Hitchhiker (Luis Mariani) go from iPad to laptop to finished master—ready for purchase and download by your fans. Mariani left Venezuela as a political refugee and, now an American citizen, lives and works in Louisiana bayou country, where he put together a band of self-described “good ol’ south Louisiana music scene boys” and makes hard-rocking music with a message. This webcast will air on March 26, 2015 at noon Pacific time. Click here to register! A great video review of the AudioBox iOne from Interactive Guitar Magazine! Thanks guys! For more on the AudioBox iOne, click here! 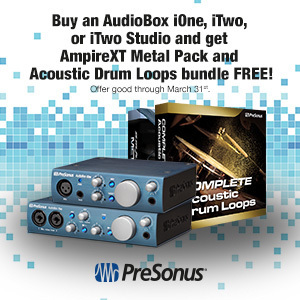 F rom now until March 31, 2015, smart customers who buy the AudioBox iOne, iTwo, or iTwo Studio will get some great bonuses: The Ampire XT Metal Pack and the Complete Acoustic Drum Loops bundle, both for Studio One. These are valued at $29.99 and $59.99, respectively, so that’s nearly $100 in free software. Oh, and Studio One Artist is included with the interface purchase anyhow, BTW, even when we don’t have a promo rolling—and that’s another $100 in free software. Just sayin’, that brings the total value of this deal to around $200 in free software. In case you don’t already know, the iOne and iTwo interfaces allow you to record audio in sterling 96kHz quality. Beyond that, you can record mobile-style to your iPad into the included Capture Duo software, and then wirelessly z-z-z-zap your recorded tracks over to your main workstation for mixdown in the also-included-and-aforementioned Studio One Artist. The Ampire XT Metal Pack features six new bröötal amp models for Ampire, Studio One’s included amp and cabinet simulator—as well as six new cabinet emulations. Furthermore, we’ve recognized that metal drums (and metal drummers) have rightfully begun to infringe on the guitar’s monopolization of the metal spotlight. As such, we’ve included a brand-new metal drum kit for Impact, rife with clicky kick drums, anvil snares, and… well, metallic cymbals. All told, this package is heavier than depleted uranium, and probably about as dangerous. How do you take advantage of this deal? Easy. Just buy yourself an AudioBox iOne, iTwo, or iTwo Studio and register it to your account at my.presonus.com. The software download links will appear in your account upon successful registration. Record in the field (at 96k, if you like) with the included Capture for iPad software, then wirelessly transfer your tracks to your Studio One workstation for mixing! For more on the iTwo Studio, click here.